Don't worry, I'm an economist! : This Trumpian neomercantilism is ridiculous! Protectionism never helped anyone. Particularly among the developed nations. I have yet to encounter a case of a rich country becoming even richer after imposing tariffs and trade restrictions. Even when looking at firm-level data over the long run, protectionism never helped. In many cases it arguably made them even less efficient (I provide a real-life example below). The notion that tariffs (taxes on imports) and quotas (limits on import quantities) are in general bad for the economy that imposes them could even be called a stylized fact of the profession. And it is one of those rare 'facts' a vast majority of economists would agree with; even those who like to emphasize that free trade has both winners and losers, and even those who cite the successes of South Korea or China in using state protectionism of infant industries to gain a competitive advantage abroad (although there are a lot more factors explaining their success - plus I have yet to see a good piece of research defending this argument). So why then, if the experts are practically unanimous, are calls for protectionism so attractive and can become so politically salient? One reason is because people don't trust experts anymore, but even when they did, they still had a misunderstanding of trade. Trade is just one of those topics everyone seems to have an opinion on, usually the wrong one. I've written before on the ills of the so-called mercantilist fallacy. This fallacy usually attracts anyone who suffers from a zero-sum game mentality. Your gain must imply my loss. If we trade with China and have a trade deficit (we import more than we export), we're "losing to China". This is the same variant of the classic saying that "exports are good while imports are bad". If I export then I get money, if I import I lose money. Let me emphasize just how ridiculous this argument is. Saying that imports are bad and exports are good is like saying that selling is good (cause we get money when we sell something) while buying is bad (cause we lose money when we buy something). Far from it! Both transactions are good, because when you buy/import you do it either to resell it at a higher price or consume it. If the transaction is voluntary it is by definition beneficial, both for the seller and the buyer, regardless if the seller/buyer is a foreigner. Also, governments, i.e. countries do not import nor export. Companies do. They sell (export) and buy (import) on the international market. In fact, the determinant of the demand for imports comes directly from the consumers themselves. Or companies buying intermediary products that are cheaper abroad. If we as customers have a greater benefit from consuming foreign rather than domestic goods, then there will be a company that will offer them to us. It will import foreign goods knowing someone back home will buy them. We as consumers therefore determine the demand for imported goods. Whether it's clothes or food, that almost any country can produce on its own, or cars and IT goods that most countries cannot. So how does all this link to the new US President? Well, it's got to do with the most recent set of ideas on trade policy coming from the experts in the Trump administration (btw, should we trust these experts over all the others? I guess we should, they do work for the President, right?). Take for instance their idea for imposing a tariff of 20% on all imports coming from Mexico. Guess who will pay the ultimate price of that 20% tariff? Yes, you've guessed it - US consumers! How? Let me explain it in very simple, Trumpian terms. I am a distribution company (let's call me 'the Middleman') which sells electric equipment (let's call it 'Stuff') all across the US. I don't make them myself, I just sell them. So when I buy the Stuff I want to sell, my main motivation for purchase will be a good (i.e. low) price. I buy most of the Stuff from Mexico, from a firm called Mexico Stuff Manufacturer (MSM) and then sell it to local shops across the country. MSM gives me a good quality product and at a lower cost than if I were to buy domestically. Now the tariff is implemented at 20% on all imports from Mexico. If I want to buy the Stuff from MSM again I have to pay 20% more. That's not very good news for me given that this would eat up almost my entire profit margin. In other words if I buy the Stuff at a higher price I have to increase my selling price to the shops to stay in business. Or, if I don't want to do that I can always find a new supplier, perhaps someone in the US - call it US Stuff Manufacturer (USSM). The thing is, the reason I didn't go there in the first place was because USSM was charging me more than MSM for the same quality Stuff. Now that their prices are, let's assume, equal, I am basically at a standstill since whoever I buy from I still have to charge a higher price to the shops. So I decide to stick with the devil/supplier I know. In each case, whatever I choose to do, my prices will have to go up. So I go to the shops and sell them the Stuff at a 20% higher price. What do they do? They push that same price increase on the final consumer and charge them the extra 20% they had to pay me. They're in the same business I'm in - they buy the Stuff from me, and resell it at a higher price to the final consumer. But why would the shops pay the higher price? Why would they be the price-taker in this case? Because they are in the exact same position I'm in - they have no choice. In either case, if they buy from me or if they decide to switch and get the Stuff from USSM directly they still need to pay a higher price than before - a price that will always be shifted to the final consumer. 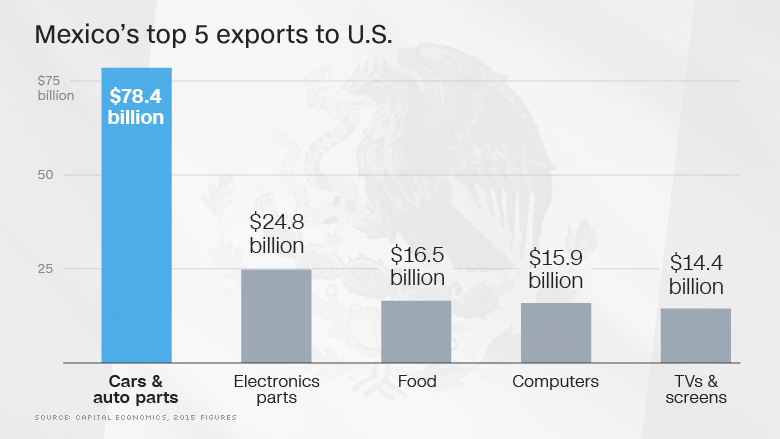 The example holds even if the price of Mexican Stuff is now higher than the price of US Stuff, because the price at which we buy the US Stuff for will still be higher than the old pre-tariff price of Mexican Stuff. What if the goods being traded are perfect substitutes? Can the US produce all this stuff? Sure it can. In fact, it does, and it exports the same stuff to Mexico (see for yourself). Why is there then a demand for these products to come from Mexico? Price competitiveness due to lower wage costs in Mexico could be only one reason (the example above explained how that works). Another very important one are individual preferences. Finally, I don't see why Mexico is complaining. Or China. A 20% tax on imports from Mexico and an alleged 40% tax on imports from China is only going to benefit the companies in these countries. Sure, they might sell lower quantities of their products, but they will more than compensate this with higher prices. Who will pay the price for this? US consumers. Protectionism is a tax on them. So when Trump says he will force Mexico to pay for 'the Wall' by imposing a tariff on their imports, I hope these examples helped illustrate what this means - it means that US consumers will ultimately pay for the Wall through a tax they won't even realize hit them. "Sure, they might sell lower quantities of their products, but they will more than compensate this with higher prices. " I was wondering if you are going to do an analysis of the House Republican Border Adjustment Tax (BAT) they are currently touting in their new tax plan? House Republicans say it will give the U.S. Government a more tax revenue however isn't there a philosophical or economic explanation that disputes this? I have been reading analyses of the tax plan and find a wide range of maybes but no definitive reasons against the plan and the (BAT) inside it. I find your blog posts simple enough to understand for someone who has a basic understanding of economics and I would like to hear your opinion of the effect this plan would have on the U.S. economy. I find lots of differing opinions on the subject but I feel that the debate over this would benefit greatly from your ability to distill this down into an easy to understand format. Don't feel pressured but your opinion would be greatly valued. Thanks much for the response your the best!